We had a tremendous turnout with near 300 people filling up Steiner Ranch Elementary cafeteria. The community was clearly engaged with the issues being discussed. We had great questions and crowd participation. We were also very lucky to have a great set of guest speakers and elected officials from TXDOT, LISD, Travis County TNR, LTFR, Travis County Sheriff, and the City of Austin. In case you missed it…. minutes and a video will be posted in coming days – so watch for that. We will also post additional information discussed during the meeting including evacuation related links and instructions. 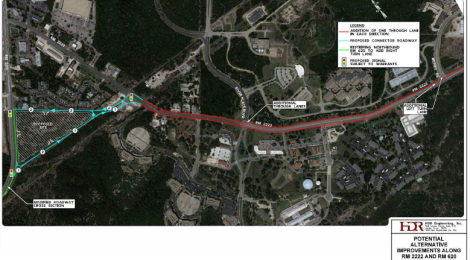 In the mean time, below you will find the full presentation PDF including the 620/2222 design concept presented by TXDOT. We are proud of the progress we have made on these important issues – but we can’t do it without support. We need your help to strengthen our organization and our impact.